Happy Monday! How was your weekend? I had a great time at my first fiesta. It was so fun to see the whole city (plus tons of visitors) turning out to celebrate. Plus I LOVE the whole confetti egg smashing thing. Although there is now confetti all over everything I own. I spent most of Sunday recovering from Friday and Saturday's festivities, sweeping up confetti, and meal prepping. Didn't have the energy to do anything fancy, but definitely was glad to be cooking some healthy food after all the delicious tacos and margaritas I ate this weekend. My vegan before 6 experiment is over, and I'm not going to be as strict about not eating any animal products during the day (hello, baked goods). But I did really like eating more plant-based foods, so I'm going to make an effort to eat LESS meat and dairy. Hence this week's vegan oatmeal recipe. Bring almond milk to a boil in a medium sized pot. Stir in oats, chia seeds, and spices. Cook until oats begin to soften, around 3 minutes. Mash in silken tofu, then add in apples, zucchini and apple sauce. Cook until oats are as soft and thick as you want them (I think I took about 5 more minutes). Stir in maple syrup and almonds. This oatmeal is super thick and has enough protein to keep me full until lunch, even though it's vegan. Plus, despite not being super sweet it still has tons of great apple pie-esque flavor. Staying with the whole vegan theme, I boiled some dried chickpeas and baked some tempeh for this week's main protein. But I still might go out and buy a steak to cook for dinner. Or some bacon. 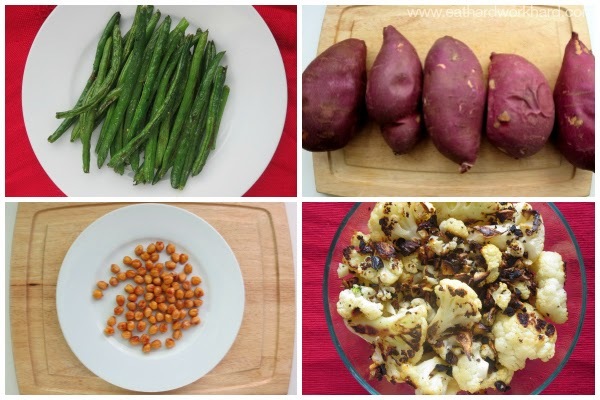 I kept the sides pretty simple, roasting green beans, cauliflower, and some awesome Japanese purple yams. 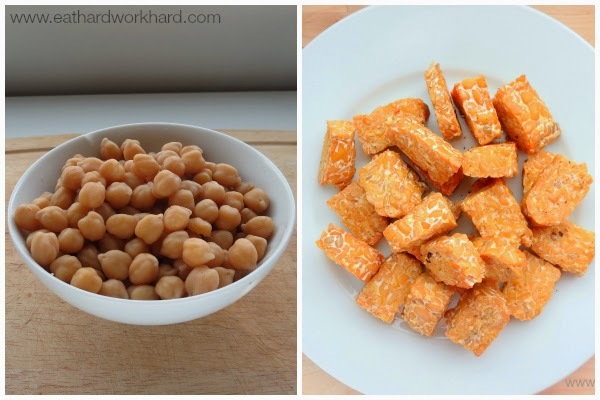 I also made a fun crunchy snack by tossing some of the chickpeas with a little olive oil, apple cider vinegar, and amino acids and baking them at a high heat for about half an hour. I'm trying to complete my fiesta recovery this week with a lot of good workouts. Q: What are you up to this week? 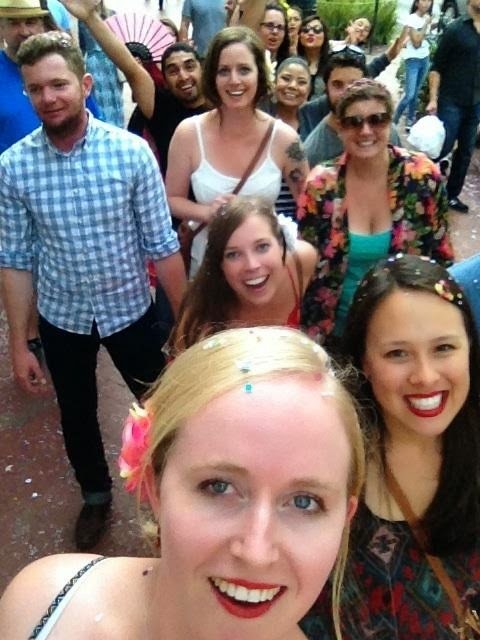 Any tips for getting confetti out of absolutely everything? I'm on vacation this week, so I'm looking forward to enjoying the beach, going on some great runs and eating some good food. I don't understand the whole confetti thing. Where did it come from? Confetti filled eggs or "cascarones" are an integral part of fiesta in Santa Barbara and are apparently used for celebrations throughout Mexico and the American Southwest (according to the internet), hence all the confetti everywhere. Hope you have an amazing vacation! Oooh I've never cooked with purple yams, sounds like it would be delicious! I love them! The first time I made them I was disappointed that they weren't the purple-on-the-inside sweet potatoes you get in Asia, but they are super yummy. 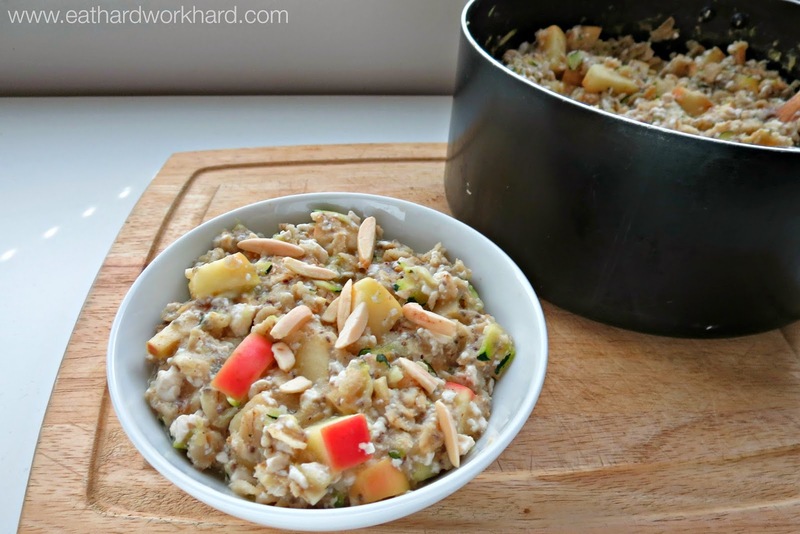 Oh yummmyyy just pinned the apple pie oatmeal to try when it gets a little cooler! Ugh confetti and glitter- always so fun at the time, so horrible when trying to clean up! Oh yay hope you like it! Yea I was really lucky not to be hit with any glitter eggs. I would still be working on getting that out till next year's fiesta!